Hollon Safe proudly introduces our new Hunter Series gun safe line. 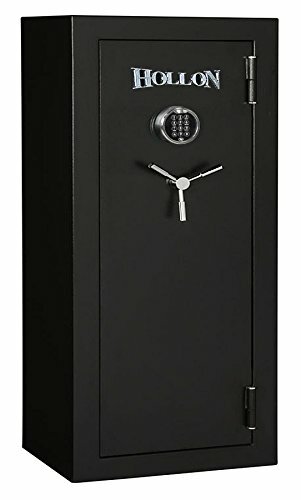 This safe has a 45 minute fire rating and consists of 12 gauge steel on both the walls and door. This means that the steel on our “entry level” gun safe is thicker than most of the gun safes found in the big box retail stores. Additionally, each Hunter Series gun safe includes up to 12 1.25 inch bolts on all four sides for pry attack resistance.We use only the Sargent and Greenleaf Military Grade EMP Rated Spartan Electronic Lock. It is a UL Listed Type 1 Electronic Lock which is designed to withstand 1,000 newtons of bolt end pressure to resist side punch attacks. A red LED light illuminates the keypad for easy access even in a totally dark room. We use drill and ballistic resistant hard plate to protect the interior of the lock. The only practical way through it is by melting it. Even if a thief were to get through we have a dual relocking system that works even if there is no lock left on the safe.Every Hunter Series gun safe comes standard with our convenient pistol pocket system on the door. This allows you to make the most of your interior storage for all types of items such as handguns and spare rounds. Each safe comes with our new plush interior with a durable “pillow trim.” Our multi-flex shelving system allows you to maximize the most of your interior space. Each Hunter Gun safe comes with four mounting holes and hardware.Why does Hollon Safe use the more expensive S&G electronic locks over the imports that other brands use?Sargent and Greenleaf’s high-security electronic locks are proven to withstand military-level EMP attacks giving you full access to your valuables even after an EMP emergency. S&G tested its most popular gun safe locks using the U.S. military’s highest EMP impact standard. An independent lab applied a radiant transient electromagnetic field on a variety of S&G keypads following the Military Standard MIL-STD461F, Method RS105 at 50 kV/m peak exposure. At the end of the testing series the S&G locks were still fully functional.What is an EMP?Electromagnetic pulses (EMP) are short bursts of electromagnetic energy that can interfere or damage electrical equipment, thus disabling their functionality. An EMP can occur naturally with solar flares or can be created by technological devices such as nuclear weapons. The high-energy particles from such an explosion would cascade down to Earth interacting with the planet’s magnetic field and destroy the electronic systems down below. This would effectively cripple the nation’s power system.12 gauge steel1-1/4″ Solid Steel Active Locking BoltsDrill resistant hardplateDeluxe interiorDeluxe pistol pocketsUL Listed Type 1 EMP Resistant S&G Spartan4 Predrilled mounting holes (hardware included)Ext. Dimensions: 59″ H x 30″ W x 21″ DInt. Dimensions: 56-1/2″ H x 28″ W x 15″ DWeight: 490 lbs.